Let's talk about trade shows! 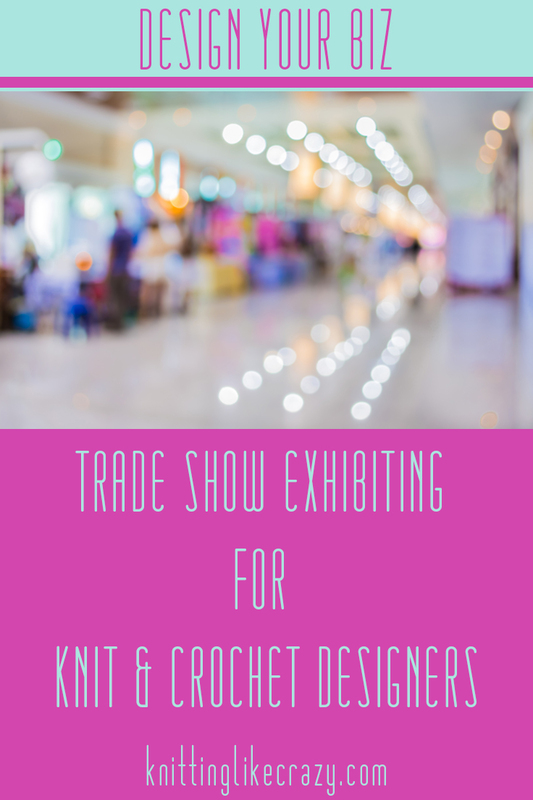 As a knit and crochet designer, there are a few options for trade shows, but TNNA is the one that gets talked about the most (at least in my circle of designer buddies, there are other trade shows out there). When I first started attending TNNA, I went to walk the floor. I'd schedule a few meetings, see what's new, and hang with my friends. As my business has grown and I've started working with a pattern distributor, I've had the opportunity to exhibit at the trade show. My TNNA looks much different now. With more and more designers (and other Business Creative Services members) exhibiting, I thought I'd talk a little bit about exhibiting as a designer. It's All in the Planning. However long you think it's going to take to get your booth ready, double it. As a designer, you have to bring a ton of samples to display in the booth. Do they need to be re-blocked? Do you need a new sample knit? You'll also need to have materials for shop owners to take with them. 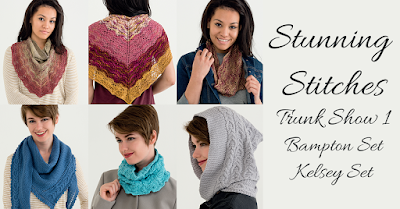 I made a mini-catalog of my patterns available through Stitch Sprouts. I had copies of my teaching brochure. These things can take a lot of time to layout and then you have to (most likely) have them shipped to you. No one wants to pay for expedited shipping! Obviously you don't want to straight up copy another exhibitors booth. But, spending some time figuring out what you like (or don't like) about other booths will help you with your own booth vision. I searched not only for booth photos from TNNA but also for craft shows. This was key for me. 10-ft by 10-ft might seem like it's easy to fill, but my first TNNA booth looked majorly empty. So this year, for my second TNNA booth experience, I added more furniture and a lot more samples. I drew out my booth on graph paper both as a bird's eye view and each wall. I didn't necessarily plan out the exact location of each sample, but I made sure that all my furniture would fit like I thought it would and it really helped me get clear on how I wanted it to look. Here's my booth from this year - nice and full! As a designer exhibiting with my pattern distributor, it's easy to go in with the mindset that the TNNA booth is only "worth it" if I sell enough paper patterns to cover the booth and the trip. But the reality is while physical patterns are an important part of my business, it's not the only part. I was also promoting my new book and my teaching. If I book a couple teaching gigs off of TNNA, it'll have been "worth it" from a financial standpoint. Exhibiting at TNNA allows me to get in front of a different audience - the yarn store owner. On Ravelry, Instagram, Facebook and all the various other social medias, I'm catering my content to the knitter or crocheter directly. At the trade show, I'm making connections with a different group of people, and one that's important to the growth of my business. In addition to the yarn shop owners, I'm also showing off my work to yarn companies, publishers and magazines. Keeping your audience for the trade show in mind really helps make the planning a little bit easier too! Have you exhibited at a trade show? What advice do you have for those planning to have a booth at an upcoming industry trade show? 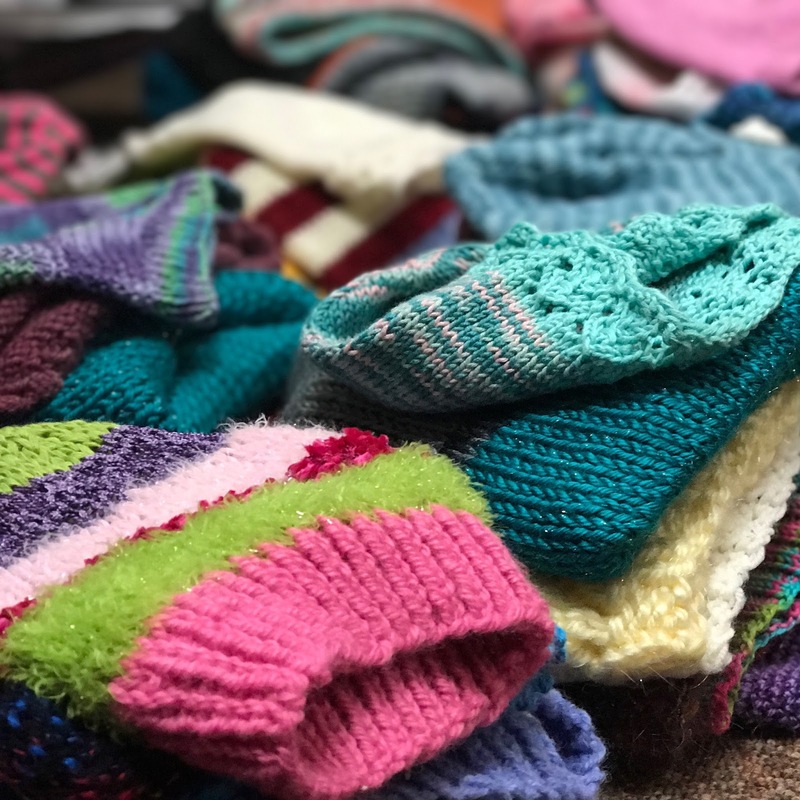 When I arrived at Wall of Yarn on Friday, they already had a pretty sizeable stack of hats ready to be donated to Halos of Hope. Their customers are amazing! I helped out the Halos of Hope crew to set up the prize table. There were lots of prizes to win! The real fun began with Franklin Habit giving a lecture at the nearby Wagner House. I, of course, used this as an opportunity to start a hat (a hat I later frogged because I was a bad crocheter and failed to check my gauge). Once we got back to the store after the lecture, it was all hats all the time! I started on a new hat, Tensfield by Martina Behm, and it was the perfect pattern for 24-hours of hat knitting! By the morning I had one done and was on my way to starting a crochet hat! I started on a third hat (another Tensfield), but didn't get it finished at the Hope-A-Thon. I did finish it on Monday though! I'll be donating it in my Summer Hat-A-Long. By the end of the event we had 375 hats, covering over 10% of the hat needs Halos of Hope has each month. It was so great to be a part of this amazing event. It was so fun staying up late and barely sleeping and knitting and crocheting for a great cause. I highly recommend that everyone organize an event like this with their shop or guild. Seriously, such a blast! The Halos of Hope Crew with The Yarn Guys and Franklin! 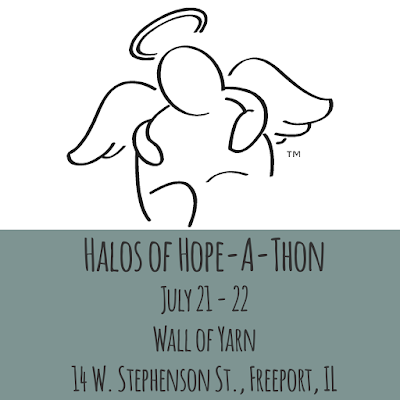 Tomorrow I head to Wall of Yarn in Freeport, IL for the Halos of Hope-A-Thon. With me, I'll be bringing lots of copies of my new hat pattern, Spero. 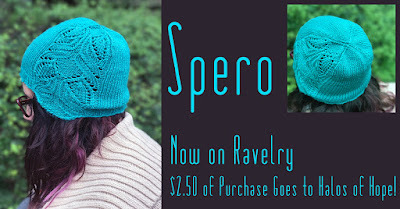 Spero is knit out of Stitch Sprouts Yellowstone - an amazing sport-weight yarn. It's one of my favorites! It takes 130 - 150 yards of yarn to make one. 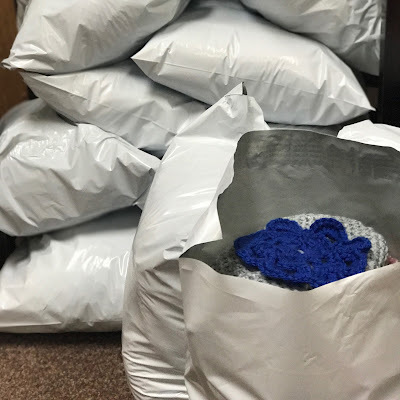 If you make the small size, you can get two hats out of one skein of Yellowstone - one for yourself, and one to donate to a local cancer center or give to a friend. If you'd like to purchase the pattern, awesome! But, if you'd like to get the pattern for free - you can! 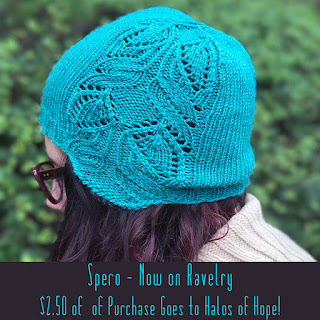 Just send me a chemo cap to donate to my local cancer center between now and September 15th, and I'll gift you the pattern on Ravelry. You just need to include your Ravelry name or email address in your shipment so I know who to give the pattern to. You can find all the shipping information here. And, if you're at the Hope-A-Thon this weekend and make a donation, Spero will be one of the patterns for you to choose from as a thank you! But, networking is an important part of building a knitwear design business and something I'd like to talk more about today. There are lots of ways you can go about building your network as a designer. I've built some great relationships online that have led to working relationships. 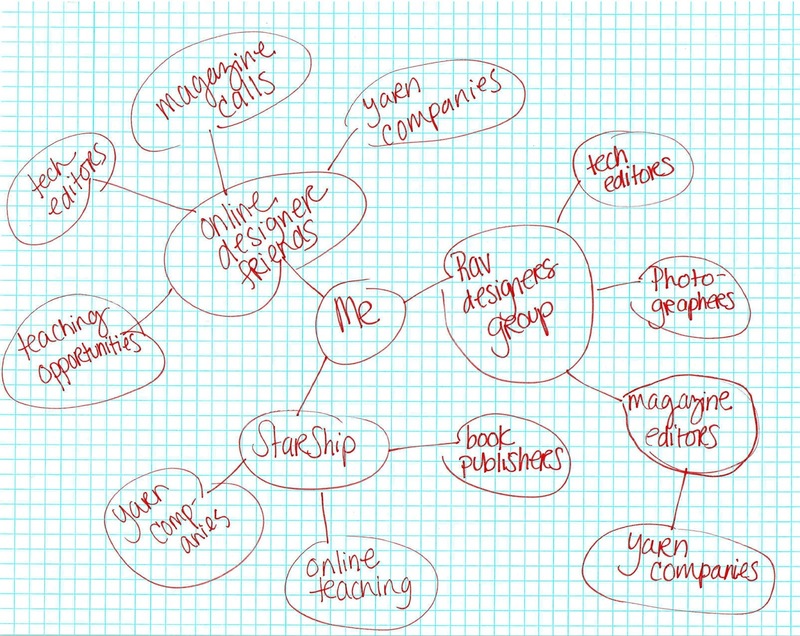 Sure, going to TNNA helps with networking, but for many people, that is a big expense. It took many years before I was able to afford a trip to TNNA as a business expense. It's a great experience and if you can make it happen, you should go, but the point I'm trying to make is that it's not the only way to build your network. 2. Facebook. There are a growing number of groups on Facebook dedicated to fiber folks that work in this industry. I particularly like the FiberBoss Collective group. I just joined recently and have already made some good connections. 3. Submit to that magazine call. I get asked a lot how I started working so much with Done Roving Yarns. It's simple - I was assigned to use their yarn for a pattern in Love of Knitting magazine. Paula, the owner of Done Roving Yarns, and I developed an amazing working relationship that's lasted for years now. Had I not submitted to that magazine call years ago, I don't know that we would have formed the working relationship we have today. You never know when the networking opportunities are going to present themselves. 4. Tara Swiger's Starship. I know I bring up Tara all the time, but her classes and Starship program have helped me immensely over the last few years. You do have to pay for the Starship and it only opens at certain times of the year, but it's been an amazing resource for me. It's designed for all kind of makers so you'll find designers, yarn dyers, jewelry-makers, finished knit & crochet item makers all in one place. It's been a great place to make connections and bounce ideas off of people who truly understand what you're trying to do. It's amazing once you put yourself out there and start networking how many connections you can make! 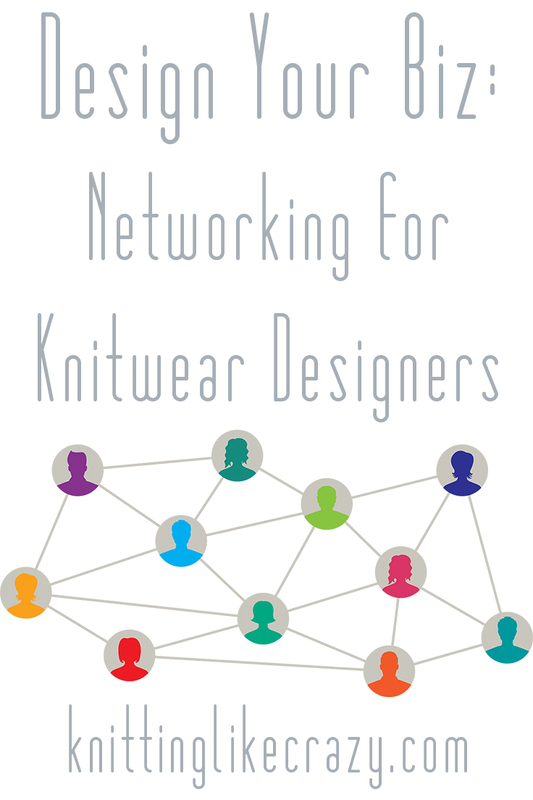 Are you a knit or crochet designer working in this industry? What other ways do you like to network? I've decided that I'll be doing another eBook collection this year. Be on the lookout for Nifty Gifty 2: Deck Your Neck coming in the late Fall! I did some stash diving and picked out the yarn for the collection. Lots of beauties in there. If you want to see how the eBook comes together, hop on over to my Patreon and become a patron! You get a 50% off coupon code when you join and become my patron. Briargate & Garter Love Now on Ravelry! I have some exciting news: two of the most popular patterns from Sock-Yarn Shawls are now available for individual download on Ravelry! I know that many of you already have the book, but if you don't and are looking to just try a pattern or two from the book, now you can. First up is Garter Love. 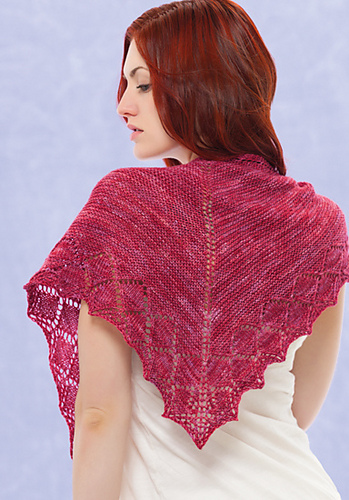 It's is a simple top-down triangle shawl with a garter stitch body and lace edge. 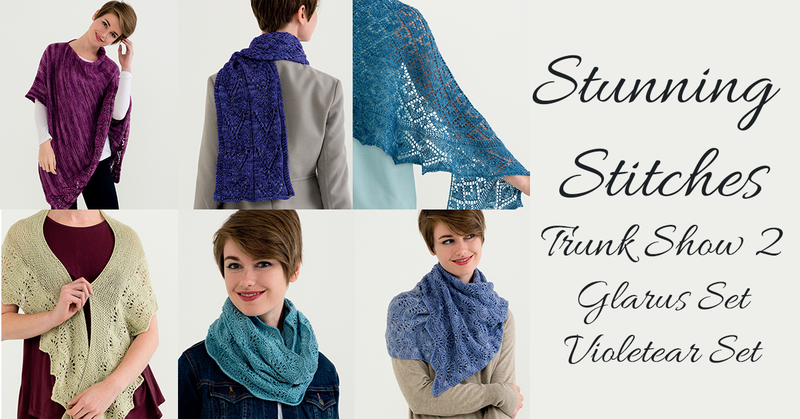 If you're new to shawl knitting, this is the perfect place to start. Briargate is my favorite shawl from Sock-Yarn Shawls. (Yeah, whatever, I say it all the time....I'm probably not supposed to admit I have a favorite. But I do. In every book. Lol). It's a fun shape with a little more challenging lace and a cool decorative faux-crochet bind off. I know you'll love it as much as I do! I get lots of emails from knitters looking for the individual patterns from my books. So, here you go! It's a start, right? :) Enjoy! Join Me at the Hope-A-Thon! 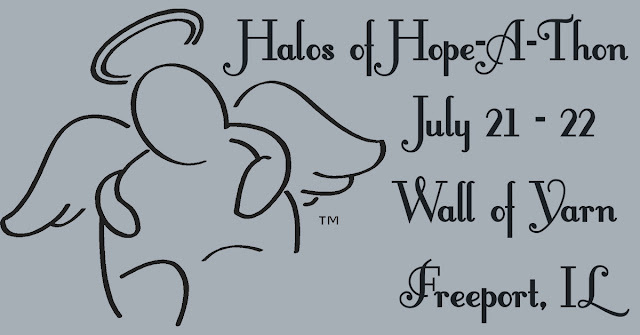 A few months ago, I blogged about the Hope-A-Thon coming in July. 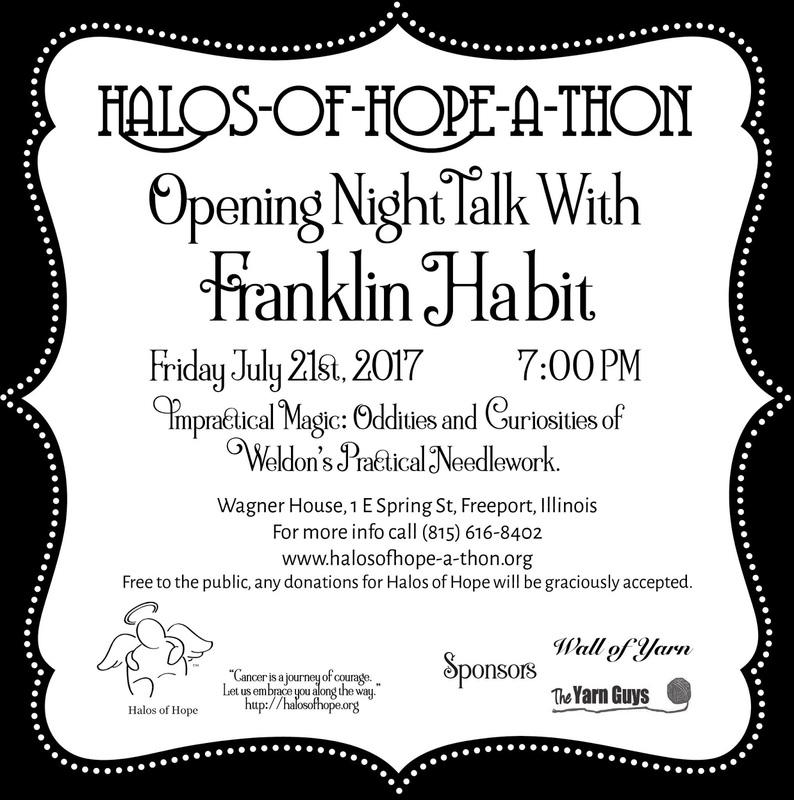 Well, July is here and the Hope-A-Thon is just a couple weeks away! 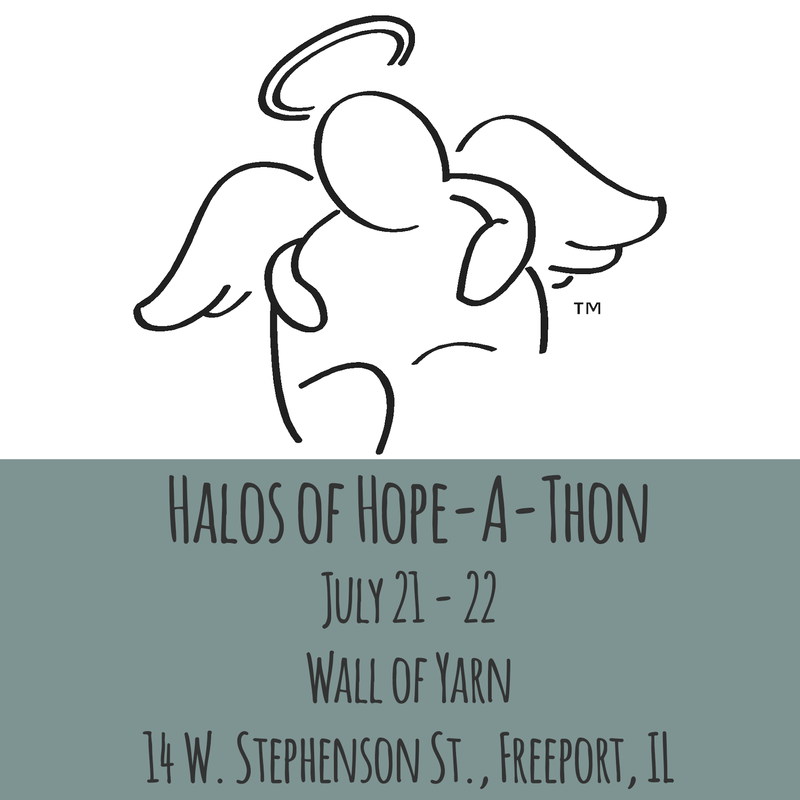 Wall of Yarn in Freeport, IL is hosting the Halos of Hope-A-Thon - it's 24-hours of hat-making fun with lots of great events happening throughout the weekend. 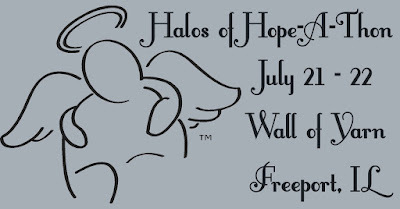 I'll be there all weekend helping out the Halos of Hope crew! 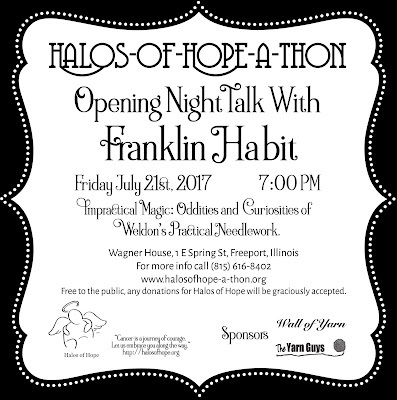 The event starts on Friday, July start on Friday, July 21 at 7 pm with a free lecture from Franklin Habit. After the lecture, we'll head over to the yarn shop (it's about two blocks from where the lecture is being held), where the knitting and crochet fun begins. Stay for a few hours, stay all night, it's up to you! On Saturday, July 22, the Hope-A-Thon continues with more hat-making. Franklin will be teaching classes, with a portion of the class fee going directly to Halos of Hope. You'll need to sign up for those by calling 1-815-616-8402. You can read about Franklin's classes here. Not taking classes with Franklin? Come hang with me at the shop and knit & crochet some hats! We'll be giving away prizes and have lots of other fun stuff going on. We'll be at the shop until 6pm working on our hats. You all know that Halos of Hope and donating chemo caps is a cause close to my heart. I hope if you're in the area, you'll consider joining in the fun! For more information, visit the Hope-A-Thon website or check out the event page on Facebook. Hope to see you there! Design Your Biz: Uh Oh, Can't Make a Deadline! So, you got your design accepted to a magazine. Yay! But now you can't make the deadline. Uh oh. What do you do? Sometimes, it happens, you miss a deadline. It's very rare this happens to me, but it has happened. One time it was my book deadline for Cozy Stash-Busting Knits - my dad passed away. 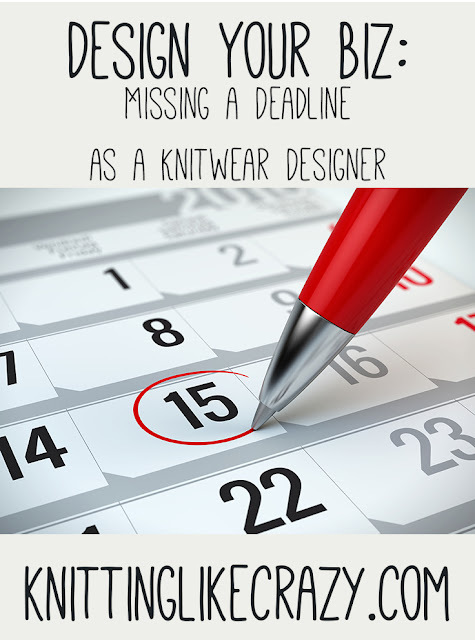 Another time it was a pattern for a yarn company - I wrote down the wrong due date in my planner. Whether you have a good excuse (death in the family) or a bad excuse (I apparently can't read/transcribe correctly), missing a deadline it never feels good. The best thing you can do in this situation, is contact the company as soon as you realize that you are going to miss the deadline. It's better to be upfront and honest instead of saying nothing and waiting to see what happens. 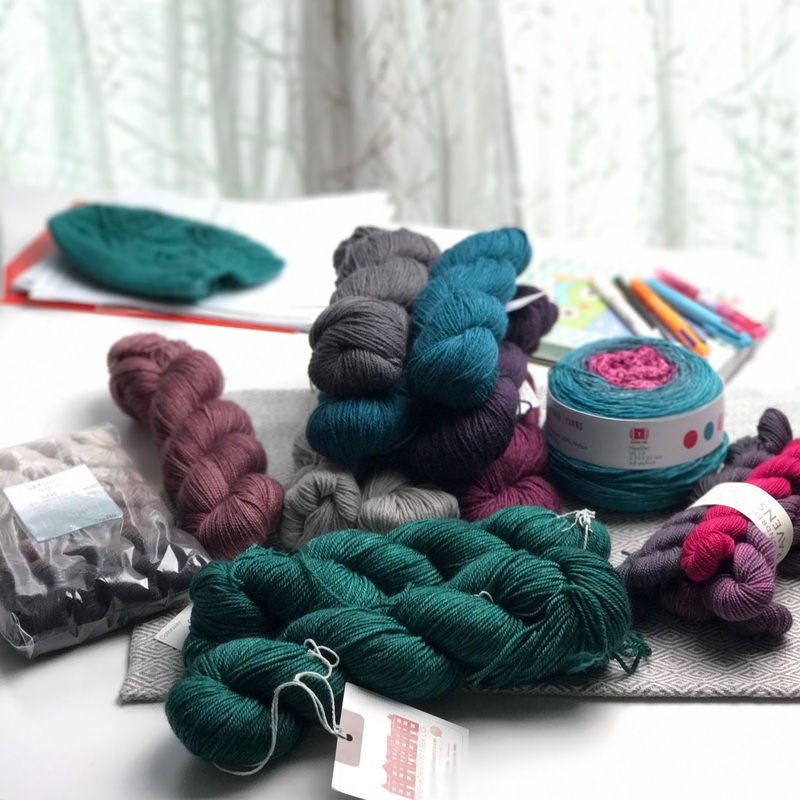 In my case with the yarn company, as soon as I realized my error, I apologized and admitted my mistake, and they were ok with me sending in my pattern about a week later (which was what was written in my planner). I've worked with them since then, it didn't burn the bridge. Just like I try to build in a little extra time to get things done a little before the due date, many companies have also built in a little extra time for the patterns to get to them. This does not mean that you can always be late though! It just means if you are apologetic and admit your error, they might be OK with you turning it in slightly late just this once. To avoid these situations completely, it try your best to plan your work around your deadlines and what you can handle. For example, right now, I'm working on another book (yay!). While I've seen lots of good submission calls for magazines and yarn companies coming into my inbox, I know that right now I can't submit to all of them. Here and there I can squeeze something in, but if I was submitting to all the things like I do when I'm not working on a book, I know that I would be in a real jam rather quickly. I'm finally learning what kind of workload I can take on, and I do my best not to overload it. That way I'm not missing deadlines! Also, and I've talked about it before - if you do get accepted for a magazine or something and you receive the contract and know that deadline won't work for you, you can sometimes negotiate it. I've successfully negotiated a deadline getting moved back a week with no problem. Being upfront is always best!